World Nomads and their partners in the adventure travel industry have today announced three adventurers from around the world have the chance to win a once-in-a-lifetime trip to The Balkans as part of the World Nomads 2017 Travel Writing Scholarship. 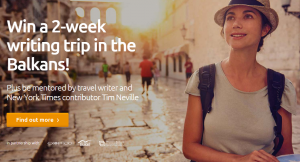 The winners will attend a writing workshop hosted by NYTimes.com travel writer, Outside Magazine contributor Tim Neville. After that they will be let loose to practice their new skills throughout Albania, Bosnia & Herzogovina, Kosovo, Macedonia, Montenegro and Serbia courtesy of Western Balkans Geotourism Network and in clothing provided by ExOfficio. World Nomads has provided round-trip flights to Dubrovnik and transfers to the workshop in Herceg Novi, Montenegro and will give them €1500 spending money to use on their 10-day exploration of The Balkans as well as travel insurance. Eurail has provided the winners with rail passes to aid their travels. The travel writing scholarship is part of World Nomads’ popular suite of scholarships that give travelers the chance to enhance their skills in travel writing, photography or filmmaking by being mentored by an industry professional. The scholarships have helped many past winners launch their own careers. The scholarships also market destinations and tourism operators through real-world adventure and cultural experiences. Since the scholarships programs began in 2007 over 48,000 travellers have applied, and this year’s writing scholarship is expected to receive 6000 applications. World Nomads and its partners will use their marketing channels to promote the campaign to a global audience and the final content produced from these trips will continue to garner worldwide exposure from ongoing promotions. Entries open on February 7th at WorldNomads.com and will close March 21st. Winners will be announced in April and the writing workshop is being held in June.